As for the start, it is better to plot the point (4,-2) on the coordinate plane to have a clearer picture of this question. Now, for the line that is parallel to the x-axis and passes through the line (4,-2), we can just draw a horizontal line as shown in the picture. 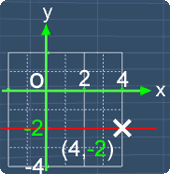 Similarly, for the line that passes through (4,-2) and parallel to the y-axis, we can draw a vertical line as shown in the picture. Clearly the answer is D.